Abbots Hamilton - Hotel and Conference Centre offers private rooms with free unlimited WiFi, free movie channels and complimentary continental breakfast. Located just 1.5 km from Hamilton city centre, Quality Hotel @ TheAmbassador offers air-conditioned rooms with a balcony or patio, plus LCD satellite TV and private bathroom. It has an outdoor pool and a BBQ area. Distinction Hamilton Hotel & Conference Centre offers spacious 4-star accommodation, just 10 minutes' drive from central Hamilton. Facilities include an indoor swimming pool, fitness centre, steam rooms, spa pools, a bar, and 2 restaurants. 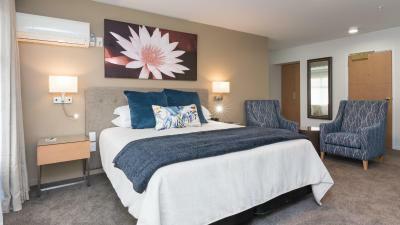 Ventura Inn & Suites is located in Hamilton’s CBD and offers comfortable and affordable accommodation. The hotel offers an excellent breakfast, free parking and free local calls. Free WiFi access is available in all areas. Featuring a restaurant, an outdoor pool and a fitness centre, Hamilton Airport Hotel & Conference Centre is located next to the airport terminal and a 10-minute drive from Hamilton city centre. Guests also have access to a tennis court and a sauna. Situated 3 minutes' drive from Hamilton International Airport and 15 minutes from Hamilton's city centre, The Narrows Landing Hotel offers boutique B&B accommodation with free WiFi and free parking. 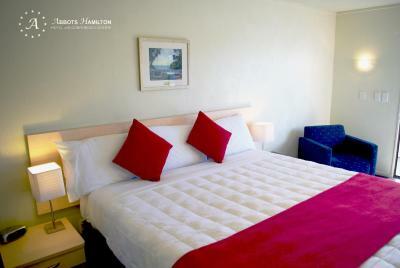 Relax and unwind at Clarion Suites @ The Ambassador Hotel in Hamilton, New Zealand. Guests can relax in the swimming pool, or enjoy a meal in The Cube Lounge Cafe and Bar. This hotel features free WiFi, a fitness room, and meeting facilities. Retro Motel Hamilton is centrally located in Hamilton, 10 minutes’ walk from Waikato Stadium. Guests enjoy an outdoor swimming pool, BBQ facilities, and a hot tub. 1GB of free WiFi and free on-site parking are provided.